The main problem with Hydragas is that, over time, the sealed units would lose gas and become less effective. Update: More than 11 years after the initial work, the first units that were fitted to a Maxi in autumn 2003 got a quick check-over – see at the bottom. From 1977/78, Maxis leaving Cowley no longer used the Hydrolastic suspension system, having been upgraded to the more advanced Hydragas system already introduced in Allegro and Princess before. The new system should offer improved ride quality and handling due to the possibility to separate the damping rates of the suspension units from the damping rate of the fore-aft-interconnection. This means losing more of the “bounciness” of the original Hydrolastic setup and gaining an increase in comfort on bad roads due to using a compressible gas-filled cushion as spring-medium instead of rubber. Sadly, after a slow decline in ride quality, one day I found both my Maxis so firm that I could not enjoy driving them anymore. A visit to the late Dr. Alex Moulton helped in finding a solution to prolong the life of Hydragas suspension units and getting some ride comfort back into the cars. Loss of fluid: The most common failure, occurring at either the suspension units themselves or somewhere along the pipes. I am not going further into this topic in this article, apart from saying that there are thoughts about renewing all rubber components in the units, but this will be a much more involved process than described below. Loss of gas (1): The diaphragm separating the gas from the fluid is defective – due to the gas and the liquid mixing there is a (sudden?) drop in pressure, but no fluid escaping. Loss of gas (2): A very common problem on older cars is the firm or harsh suspension. The usual cause is the slow loss of gas due to slow evaporation through different parts of the Hydragas displacer. This cannot be avoided and shows in a car settling at a lower ride height evenly over the years. Depending on the use of the cars this is probably not noticeable for the owner in the first 10-15 years, but should be dominant amongst most Hydragas cars by now. Owners will have noticed that resetting the ride-height to normal will help in the beginning, but later on the car will get harsher the higher it sit’s and doesn’t seem to have any movement in suspension at all. The third problem was the one affecting my Maxis so much that I hardly used them since it was so uncomfortable to drive in them. This is when I approached Dr. A. Moulton in search for a solution. I am very glad he offered me to meet and discuss the topic in summer 2003, leading to the solution described in the following sections. Looking at a Hydragas displacer, the steel sphere sitting on the rear of the unit is most prominent. This does contain gas (Nitrogen) at the outer end and Hydrolastic-fluid (basically water and alcohol) at the inner end separated by a flexible diaphragm. If there is a big part of the sphere filled with gas, the car will ride softly, since there is a big cushion that can be compressed, meaning a longer wheel travel. However, at the other extreme, if there is nearly no Nitrogen left, then the gas-cushion is very shallow and not much wheel-travel is possible resulting in a firm ride. The second component affecting the volume of the gas-cushion inside the unit is the line-pressure of the suspension fluid. Due to the shape of the pistons acting on the Hydragas displacers (a cone), the pressure needs to get over-proportional higher if the ride height is set higher. Since the cone-shaped pistons mean that less volume needs to be displaced when the wheel hits a bump, the higher pressure should result in a softer spring rate. However, as in the case of old suspension units with low residual gas-pressure, if the gas-cushion becomes too small due to the high fluid pressure, the car will appear to be very harsh and will get softer again if the car is lowered a little. There is a significant risk of damaging the internal diaphragm when using the car with very low amount of gas remaining. The rivet on the top sphere, which covers the original opening from filling the gas spring in the factory, does protrude into the sphere. When the gas spring becomes very weak and the gas cushion very shallow, the internal diaphragm can chafe on the end of the rivet and start to leak – which will render the unit unserviceable currently. On the other side a car sitting low due to low fluid-pressure may be dangerous since the diaphragm inside the sphere may expand to fill the complete sphere off the Hydragas displacer. In this case there will be no springing at all unless a bump raises pressure enough to overcome the gas pressure and compress the gas spring! This is the reason why simply lowering a Hydragas car by reducing the amount of fluid can be a very bad idea! To get old units back to proper working order, Nitrogen needs to the refilled to the spheres through the fitting of valves. The picture below shows three units ready to go into a car again. For each displacer a Schrader-valve, just like the ones fitted to the fluid-lines of Hydrolastic- and Hydragas-cars, is needed together with a socket where it can be screwed in. This socket needs to be of steel, so that it can be welded into place. Next you need to look out for a solution on how to fill the units with Nitrogen, once everything is put together. A tyre fitting place might sell ‘tyre-gas’ or whatever they call it – this is usually Nitrogen. Many of these are able to supply up to just under 10bar pressure. More convenient, but also more expensive, is to buy a pressure regulator with a regulating range of up to 20bar and some hoses and a filler adaptor. 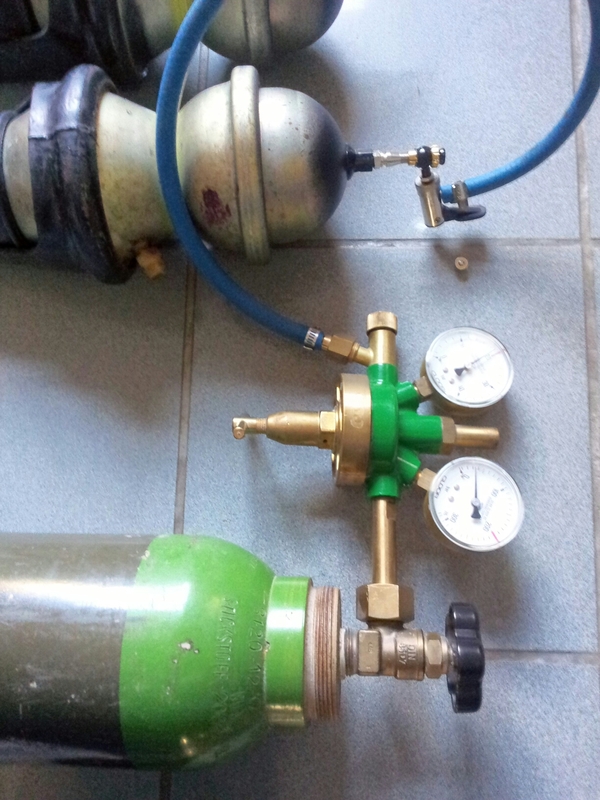 Using this equipment I was able to rent a (small) bottle of Nitrogen and do the pressurizing of the gas-spheres at home. Costs may vary between £50 and £100 for the equipment. First, the old gas needs to be released from the displacer. Carefully bore out the small rivet on the end of the displacer. This is also the place where the valve is going to be fitted. It would be a good time now to flush the fluid-side of the displacer with fresh water thoroughly. You’ll be amazed how much muck will be coming out there! Now widen the drilled opening in the sphere so much that the socket for the valve will fit nicely into or above it. Remember that it has to be welded into place later. For welding the adaptors for the valves onto the units I would recommend using a WIG welder, since this keeps the welding spot relativly cool and helps to avoid problems with warping metal and heat. It is also adviseable to cool the rest of the sphere with wet rags so that the danger of damaging the diaphragm with heat is lessened. The valves can then be screwed in. We sealed the threads additionally. Each unit can now be tested by putting some air-pressure on it with a tyre filler. Examine the area around the valve for leaks in particular. If there is enough time, leave the units pressurized for a few days to have the chance to detect very slight leaks before everything is going in the car again. If the car is run at standard ride height the fluid line pressure will always exceed 20 bar. A Nitrogen charge between 1/2 and 3/4 of the fluid pressure is recommended – the exact value does not matter too much, as the spring rate is mostly determined by the cone shape in the displacer. With a higher volume charged the time to the next re-charge will be longer. On the Maxi there is enough space around all displacers to be fitted with a valve as described above. But for later servicing (the unit might need to be recharged every few years) it is adviseable to use not to high sockets at the front. It is then possible to fill Nitrogen with the displacers in the car. On the rear end the problem is different. On the RH side only the spare tyre needs to be removed to access the valve. But on the LH side the tank hides the access to the valve so either the tank or the displacer will have to be removed. To get around this problem one of my cars received the valve sitting on a piece of bent pipe, so that it is accessible. 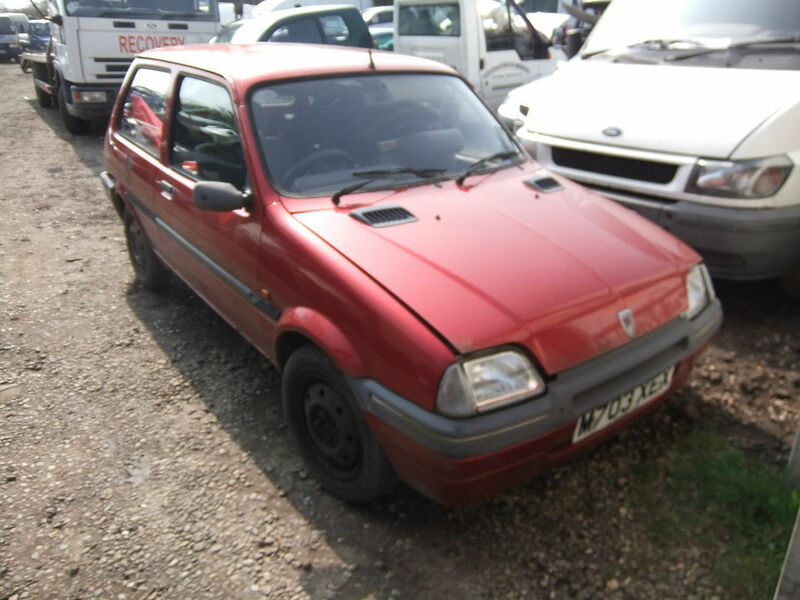 The parts were sourced from the Hydragas suspension pipes of an Rover Metro, but there might be other ways to achieve that. The first car we used to test modified Hydragas units according to the above given description was Alexander Boucke’s blue Maxi, which went on test in October 2003. Initially, we were only able to fill the gas spheres to a relatively low pressure of 10 bar, because our only source of Nitrogen at the time was a local tyre fitter. The suspension was set a little lower – and thus firmer – than standard, so the car ran well on good roads, if a little firm on potholed ones. As London roads proved to be too bad for comfortable driving in this setting, the car was ‘uprated’ to a softer setting in the summer of 2007 – the accessible front spheres were charged to 20 bar and the car pumped to standard ride height afterwards. Later, in Autumn 2012, the ride height was re-set one more time. 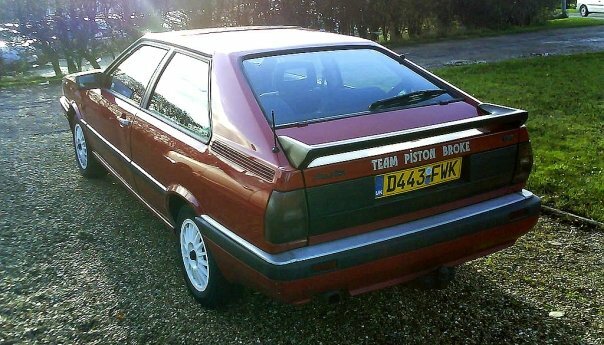 By then the car had sunk noticeably on the front, but slowly and evenly over the years, indicating all was in good health – the ride height was restored to correct trim level. However, at the end of April 2015, 11 1/2 years after the original re-charge took place, the suspension system was drained and the tank removed to access the rear units – which had been un-touched since the low charge of 10 bar in autumn 2003. The car was still on even keel, but had again lost a little height and felt quite firm at the rear end. A test with a simple, hand-held electronic tyre pressure gauge showed a remaining pressure of 4.3-4.4 bar in both rear units. The front units were not properly accessible with the gauge as it was not possible to set the gauge onto the valve without Nitrogen hissing past the gauge. Such a reading trial ended showing nearly 6 bar, indicating that the front units still contained a significantly higher remaining pressure – as would be expected considering the intermediate upping of Nitrogen in 2007. There are three more cars where the units have been re-charged between 2003 and 2007. We know of one unit that started to leak fluid, but this has been returned so that we are able to re-assess the gas fill. Apart from that particular unit, these cars also sit level and seem to ride well according to the owners. Going from that experience it seems safe to say, that the new charge of Nitrogen does help to significantly prolong the useful life of Hydragas suspension systems. We can also assume that checks of the gas pressure will not be needed at too frequent intervals – depending on access of the units on the car a check and top-up at 7 to 10 year intervals seems reasonable. Now the blue Maxi is back on properly charged Nitrogen spheres (at 18 bar) and standard ride height – ready for another 10 years of motoring! If you have questions regarding the recharging of Hydragas units, please contact me by email at ado61@aronline.co.uk. The process for the Princess is exactly the same. We have done some by now and they respond very well to recharged displacers. A charge between 15 and 19 bar will give optimal results, go as high as you can up to 19bar for longer lifetime of the charge. Have you had any experience with the Hydragas units in MGF’s? What pressures would you recommend and I presume that you prefill the units with Nitrogen prior to reinstalling them and that the pressure (without the fluid on the otherside of the diaphram)is not sufficent to damage the diaphram. Also is the problem of lost gas usually due to the diaphram rupturing or is it more likely to be porosity? Personally I have not yet recharged MGF units. But I know it has been done already. The gas gets lost mainly by diffusing through the walls and rubber diaphragm – just like any tyre will lose some air over time. As in the factory the gas will be charged with the unit out of the car and no pressure on the fluid side. You should fill the unit with 1/2 to 2/3 of the pressure you run on the fluid side. The main problem on the MGF is that there is no space for the valves without modifications to valve position or bodywork. I live in Australia & have a MK1 Metro. The Metro was never sold here in Australia & is quite rare, thus information here is very limited . I have just bought this low mileage vehicle & the Nitrogen has leaked out of the spheres. I have removed them & TIG welded bosses in to the top of the spheres & now wish to recharge them. I see you have provided the Nitrogen pressures for the front & rear displacers (Thank you), so is it just a matter of charging the nitrogen to that pressure, & them pumping the fluid up to the correct ride height? Also, I wish to convert it to the later interconnected type suspension. I have organised 4 Rover 100 displacers & interconnection pipes that are in transit at the moment. The question I have is do you know what the nitrogen pressures are for the interconnected suspension type spheres? & again, is it simply a matter of evacuating the suspension & then pumping the fluid up to the correct ride height? If you are seeking to the convert a Mk1 Meter to interconnection, I think you will have great difficulty. I personally raised the same with Alex Moulton on a visit to Bradford on Avon in 1990, his prompt advice “Don’t” he continued by saying all the leverage ratios are wrong and everything has to be re-made, remember he was the inventer and he had converted a Metro known as ” the Brown Car” to demonstrate to Rover etc. He then elaborated that the motor car industry was in such a mess they were “giving away ” the Rover 100, and that was his advice to acquire an interconnected Metro. the process on the Metro is the same as on all other cars – be it interconnected or not. Nitrogen needs to be filled before pressure is applied to the fluid side. If you know the pressure of the fluid for the car at your preferred ride height, the pressure of the new Nitrogen charge should be between 1/2 and 2/3 of that of the fluid. Never put in a highre pressure gas charge than the fluid pressure you intend to use – the result will be a car with no springs and hardly any damping! Obviously the pressure will be the same on all four units of an interconnected car. With the recharged displacers fitted to the car, the process is as given in the manuals (i.e. evacuate and then fill to the desired ride height). I have a nice old chap with a Hydragas suspended Maxi, of 1979 Vintage, that i’m involved with doing a few long overdue jobs on!. The biggest problem is that the n/s/f displacer has gone almost solid and according to my pump gauge it has well over recommended pressure in the nearside system!. It sits slightly crooked and tries sending people into orbit over bumps….According to its owner it has been pumped up twice is as many months, getting more solid each time!. Do you think this unit is beyond salvation? This is difficult to tell from the distance. First I would not entirely rely on the pressure gauge as long as you are not sure it is properly calibrated. If there is no other defect in the suspension (binding bearings or such), the car is sitting level and has been moved forth and back a little (to eliminate tyre scrub) as per manual, the height of the car is all you need – and it relates directly to the pressure. It is very likely that the remaining Nitrogen in all units of the car is not enough to ensure good springing. As the interconnection will always add some suspension it is difficult to tell if any Nitrogen is remaining while the units are in the car. But even if nearly all Nitrogen is gone, the chances that the unit itself is not defect are reasonable, so that the repairs detailed above can be made successfully. But this can only be found during the work (after fitting the valve and testing it). Don’t hesitate to get in touch with me using e-mail (see ‘contact us’ page at the bottom). I would be tempted to use a MIG brazer instead when welding in those filling points. Thanks for all the info above. I’m in NZ so I suspect shipping the spheres from my 1982 Princess to you to fix would be cost prohibitive. Do you have any links/urls for any companies on the internet that might sell the parts (valves, nuts, pipes, etc) to do be able to get this done locally please? Alternatively, could you please confirm the specs and names of the pieces required so I could search for them? First off many thanks for your excellent article that is simply the most knowledgeable & at the same time practical piece out there. A question though, I’ve just bought a Wolseley 18/22, and having read your comments above, is there a clever way to access the units without having to take them out if the gas needs to be topped up? The units are fitted in a cross member tube/structure which has no access points. Do you think that it would possible to fit a pipe/tube directly into the gas unit that leads out into the engine bay and fit a valve on the end of that tube? Also currently what’s the charge for doing a pair of gas units? I have a 1981 maxi hl2,when I bought it in May the suspension was low and lower on the passenger side,as I have never had one before I asked the previous owner about this and of course said he’d never had any problems. now I am learning more and have had the fluid pumped up it sits higher but as like before its unpleasant to drive because of the bumpiness. If I remove the displacers and bring/send them to you in Aachen,could you fix them?and if so how much? How brill is this site? 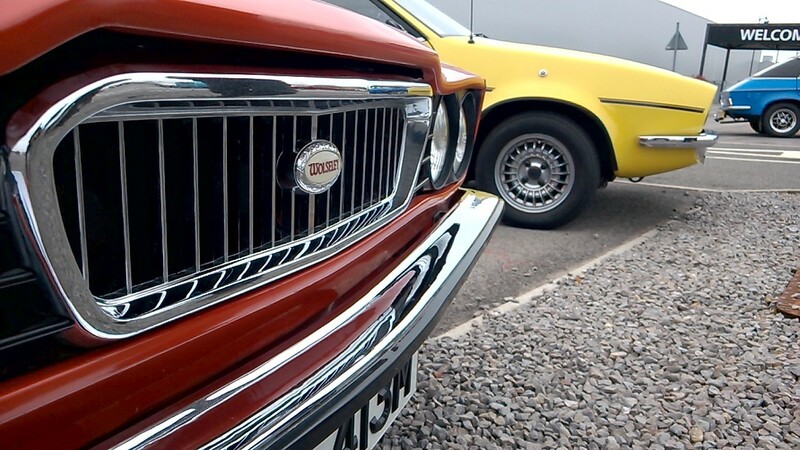 helping to keep classic cars on the road all over the world! Absolutely fantastic. Long may It continue. Best wishes to one and all. Have got an mgf with hydrogas system. Suspension very little movement, no leaks on fluid and bouncy when going over bumps. Someone gas suggested nitrogen gas has been lost. How can i check? A new displacer has just been fitted to the rear nearside of my VP 1974 mk 1 1500 and wonder if my mechanic should pump it up with fluid according to the ‘fingers’ test above the tyre or go exactly to the measurement given in the handbook? If we do the latter the car appears on stilts! If we use the rough guide of the fingers test is it 2 fingers or three and should it be applied at every corner or just at the front? the original data given often let the cars appear to be riding very high. The best comfort will be achieved when the car is pumped up to the height given in the handbook. If you prefer to have it sitting a little less high, this is perfectly possible, but I would not recommend removing more than 2cm from the given height. The ride will become firmer and if lowered too much, it will possibly be unsafe too. PS: measurements should be taken at the front. Most of what you write sounds quite familiar to someone used to Citroen’s hydropneumatic suspension that at least for the purpose of bump absorption uses a very similar principle. 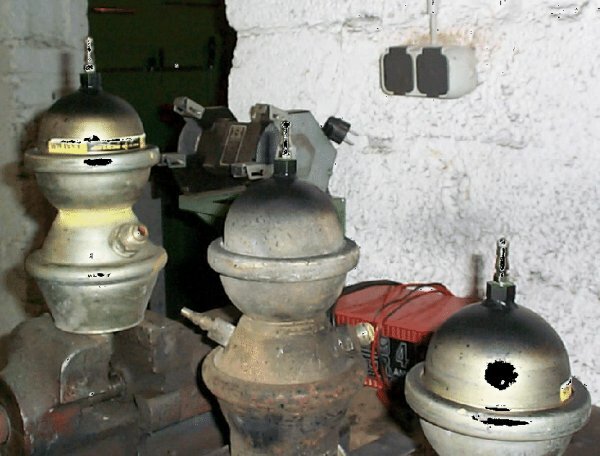 There also is a possibility to fit tyre valves to Citroen spheres in order to recharge them. These valves are screwed in instead of welded on because what is a rivet in the hydragas sphere is a bolt in a hydropneumatic one. I was astonished to see how low the pressure in the Hydragas spheres is – older Citroens have between 40 and 60 bar in their spheres and the hydraulic system’s operating pressure is stated as 179 bar. It is very important to get the correct gas volume in the system because according to the laws of Boyle-Marriott and Gay-Lussac there is a direct correlation between the change in volume of the gas (when the car hits a bump) and the increase in pressure in the gas sphere (resulting in a harder spring). These gas suspensions by default have very progressive characteristics and therefore can be quite soft around the standard position. this possibility should not be wasted by having not enough gas in the sphere. My wife bought a 2001 MGF about 12 months ago. The ride soon deteriorated until it was unpleasant at 30mph and undrivable at 50mph. After several attempts by the dealer to rectify the problem by pumping up the fluid, I found Ian Kennedy at hydrosuspension.com after which it all became clear. I removed the displacers and took them to Ian who duly filled them with fresh nitrogen. After refitting them, pumping up the fluid was easy. I bought a plumber’s hand pump, schrader valve fitting and fluid on internet for under £100. The result has transformed the car into a pleasant, drivable alternative vehicle. I would suspect all MGFs will need this treatment eventually. I have owned many Citroëns since a very young age, I used to live in the U.K about three decades ago, been in Canada for as long . I recharge my five Citroëns spheres and the accumulators , these have a charge rate of N2 of 62Bars, whilst all the other spheres on the suspension vary according to model and type , I had started off with a custom built head and a metal cage, this latter would hold the sphere in place, plus it would allow me to check if the diaphragm in the sphere is still good? If it have at least 10bars, I am inclined to charge and check in a day to verify if it’s not leaked out. I had bought a charge head with a built in N2 Regulator, it was bought from a company in Italy known as Technosir, the same also see the various shradar valves, though they are called Valprex valves. Basically the System is self contained, I.e the head and the regulator is built as in a single block, thereafter a high pressure rated 300Bars pipe fits over onto the Valprex Valve that would have been fitted to the top of the spheres, removing the Original fitting. The charge head have two gauges, one shows the contents of the N2 in the bottle, whilst the other gauge shows what amount of N2 is being released into the spheres. Practical Classics magazine , recent edition dated Spring 2019 20 March to April 17.